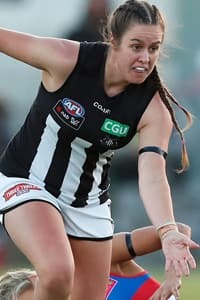 AFLW dares to dream Listen to key defender Nicola Stevens as she reviews Collingwood's win over Greater Western Sydney at the Holden Centre on Sunday. Caitlyn Edwards hunts the ball during Collingwood's win over the Western Bulldogs. Having resided in her adopted home of Melbourne for almost four months, and having played every AFLW match to date, WA-born Collingwood Women’s player Caitlyn Edwards only has one complaint – the weather. “The one thing I’m not a fan of here in Melbourne is the weather. I’m from sunny Western Australia, so that’s been an interesting adjustment for me,” Edwards joked as she spoke to Collingwood Media this week. The 20-year-old packed up her bags and jetted across the country late last year to chase a dream once fuelled simply by wanting to be like her mother. “The only reason I wanted to play footy was because my mum played the sport back in the day, and my brother had also played footy. Before joining the local junior football club at age 10, Edwards honed in her craft, like many, in her backyard. At the Thornlie Lions, Edwards played some of her junior football with former Carlton player, Clem Smith. When Edwards was 14, she had to move to women’s football as league rules stipulated. In her first season following the switch, she won a premiership. Following her instant success, the defender moved to East Fremantle where she played the next four years in the highest women’s football division, the WAWFL. During her time at the East Fremantle Sharks, Edwards represented the Western Bulldogs in the 2014/15 exhibition games; was awarded the 2014 Best & Fairest and was a two-time All-Australian. She played with fellow WA recruit and now Collingwood teammate Ruby Schleicher, and was coached by Collingwood midfield coach, Nikki ‘Webbo’ Harwood – an esteemed women’s football player and coach in her own right. During her year 12 studies, Edwards played rugby at school, as football wasn’t available. “I was playing rugby on a Saturday and footy on a Sunday, which was hectic, but incredible. I loved it, but I did have to manage my body a fair bit. The changeover proved beneficial, as the WA native was drafted to Collingwood with pick 43 in October’s AFLW national draft. However, with dreams of travelling on the 20-year-old’s horizon, if not for a mother’s intuition, Collingwood may have not been able to secure the services of its attacking defender. But perhaps even her own mother was taken by surprise Edwards decided she wanted to move to Victoria to play footy. Growing up supporting the Fremantle Dockers, Edwards says there was mixed emotions when she was drafted to Collingwood. Adjusting to the Melbourne lifestyle has been made easier thanks to Edwards’ roommate and Collingwood teammate, fellow WA-native, Tara Morgan. With the No. 1 guernsey on her back, and her distinguishable longs braids, Edwards has played every game for Collingwood in its debut AFLW season. Recruited as a running defender with a precise left foot, Edwards has been trialled in a number of positions this year. “I’ve been moved around quite a bit. I’ve played as a half back, as a forward and even in the midfield, so it’s been a great learning curve and beneficial in my development. I haven’t played a lot of time on the wing, but I’m trying to learn that position. Edwards says one of her favourite moments from the season was in round five, when she and her teammates travelled back to her home turf to face the Dockers at Rushton Park in Mandurah. “It was awesome to be on a ground that I played so much football on, I felt more confident. Even to be on home soil, with a home crowd – despite them not barracking for Collingwood – was amazing. Away from footy, Edwards has been working at BOUNCE in Essendon Fields, and worked as a PE Assistant back in WA. She says she’s been content with her first year of AFLW football, and despite playing every game, believes she can play at a higher standard next year. “I wish I had prepped myself a little better in terms of my fitness. I was fit, but I was rugby fit, and AFL fitness is a different ball game. In the offseason, she’ll be heading back to WA to play rugby, before sitting down to decide whether she wants to pursue football in her home state, or come back to Melbourne to play more footy. For Collingwood’s sake, let’s hope she chooses the latter. We’ll be in prime position to hold onto her after she admitted she’s loved her time at the Holden Centre. “I think it’s awesome this club has four teams, but at the end of the day, we’re one club. It’s a great environment to be in. “I’ve really enjoyed watching the netball program blossom here as well. I played footy with Ash Brazil – who is an absolute gun at footy and netball – and it’s great having her at the club. I also love being around such professional athletes in Sharni Layton and Caitlin Thwaites. Edwards will be looking to extend her streak of seven straight AFLW games this weekend, while her team will be vying for four wins in a row when they meet Adelaide at the Holden Centre on Sunday afternoon.